Keeping a clean floor is quite the formidable task, and even more so when you have kids who turn your home into a high traffic area. They never seem to know just how tedious it is to keep the floor clean, as they bring home mud and dirt from outside without second thoughts. The Mirabella Steam Mop aims to make life easier for the homemaker. 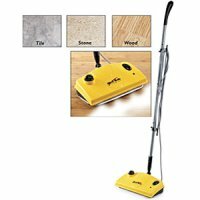 Powerful, penetrating steam eliminates dirt, dust, bacteria, dust mites, and other allergens without toxic and harmful chemicals. Just add water, plug it in, and it’s ready to go in just 2 minutes. Works on all hard surfaces-wood, laminate, marble, ceramic tile, and slate. Includes 2 washable, reusable pads. Weighs just 3 lbs. and has a 15 ft. long cord. Durable plastic. 44″ high, with 12″ wide head. The Mirabella Steam Mop looks like the perfect gift for mom as she doesn’t have to scrub the floor that hard anymore each time her kids come in from outside without first cleaning their shoes on a rug. You can bring this home for $49.99. Gee, I didn’t know coolest-g’s was into straight up advertising for mops. Love the Mira Bella steam mop. But where can one purchase additional cloth mop heads?